it is an interesting one to be observed, kind of makes MOND somewhat unlikely. Probably formed from discarded material during a galaxy merger... ie almost like what is observed in matter distributions in the bullet cluster. If we assume that dark matter exists as a starting point then consider the possibility that this galaxy has had an interaction with an even bigger galaxy I wonder if it is possible that when this happens dark matter as well as stars themselves can be 'taken' from the smaller galaxy? 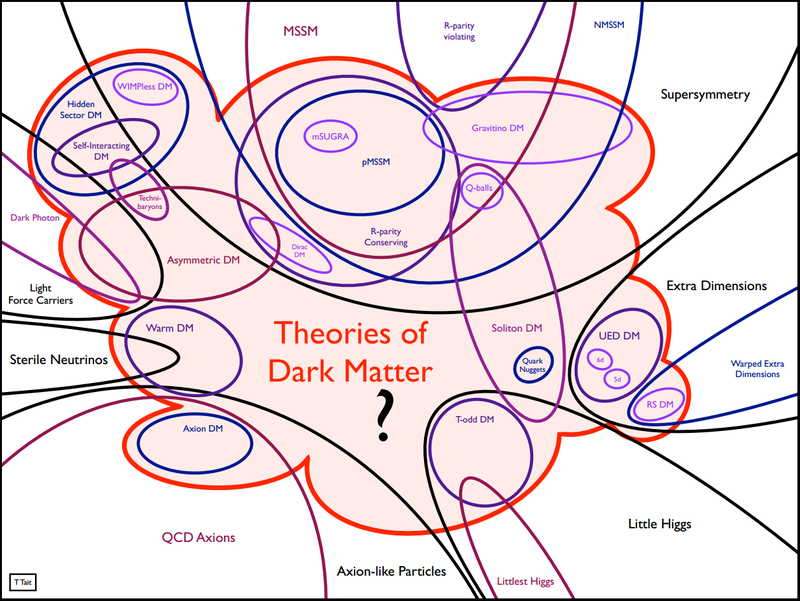 If I understand correctly (and I probably don't) dark matter only interacts gravitationally so would that mean that a 'heavier' galaxy could steal the dark matter along with stars from it's smaller cousin? This could explain both the lack of dark matter and stars 1/400th and 1/200th respectively in comparison to our own galaxy the Milky Way. Is there a galaxy nearby to this one that may have had an interaction with it? If so I would be checking to see if gravitational lensing suggests it to have more dark matter than expected. Would it be reasonable to assume that if dark matter can interact with gravity that it can interact with itself? The meeting of two galaxies should then see a dark matter 'exchange' with the larger galaxy basically taking mass from the smaller one and what we are seeing now is a globular cluster stripped of it's mass (both visible matter & invisible dark matter) from an interaction with a much bigger galaxy. It's too much for my head to be honest. I'll get my coat. Maybe it's time to consider that what is being detected is an indication of interactions with some kind of additional unseen dimensions. Since there's no way for us to observe such things directly. Said with such certainty and yet doesn't address any of the actual physics behind dark matter. Dark Matter can be a number of things and comes in a lot of different breeds theoretically and work fine with the Standard Model. - If it isn't an extra dimensional effect (again we have no strong evidence for extra dimensions) given it was created, then the coupling it might exhibit would be via the weak force only. The two strongest candidates being WIMPs/supersymmetry (no its not ruled out) and Axion like dark matter. There are currently 2 multi-ton scale dark matter experiments running right this moment and, im not sure how many axion searches, but i think its about 2 or 3. So to say we have no way of detecting it is to ignore the possibilities that are out there before doing any form of investigation, and assuming something to be true with no evidence. Not only that but, did you know... science is already considering your stipulation, its been a postulate of theory for decades.